Running from vampires in the sewer. Note the pink and green eighties lighting. Having moved to Los Angeles with the dream of becoming a professional stop-motion animator, I initially found it very difficult to get my foot in the door of the movie business. I managed to get a few gigs making miniatures as a model maker, but even those jobs were hard to come by for a newcomer. Then the opportunity came to work on my first feature motion picture, starting at the very bottom... the sewer! 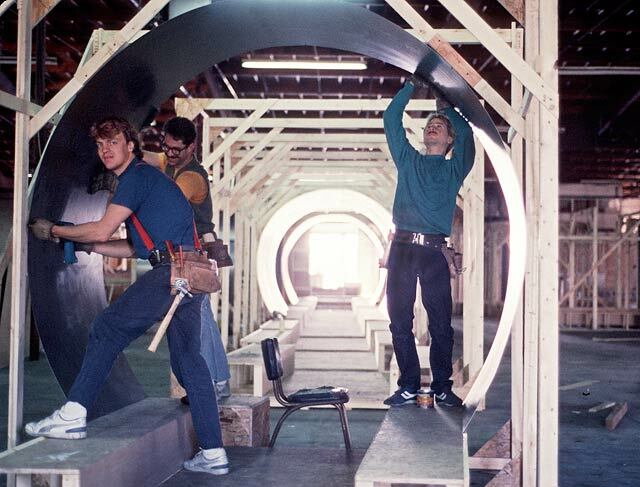 Okay, in actuality I was hired to build a sewer, as part of the construction crew on the horror movie VAMP in 1986. Taking a break in the nearly finished Vamp sewer set. 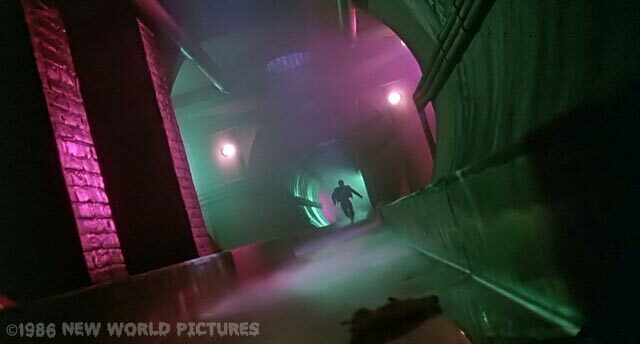 Much of the latter part of the movie took place in the sewer, which required a gigantic set for those scenes. My friend Michael Eschger and I both had detail oriented carpentry experience, and were promptly put in charge of the project by supervisor Mike Bingham. 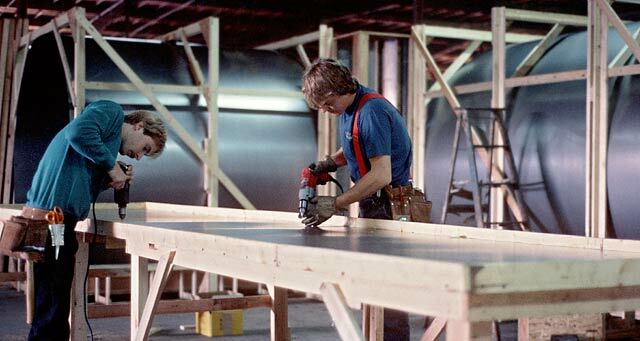 The construction methods for movie sets were different from the norm, as they were meant to be temporary, built quickly, and torn down when the filming wraps. It was interesting to learn the various building techniques, which came in handy many times later in my career. What was particularly challenging about this set was the decision by Bingham to build the pipes out of sheet metal. The material was nasty: heavy, sharp edged, and difficult to drill and cut. Michael and I were expected to make the metal tubes perfect, each section had to align exactly with no gaps in the joints allowed. All that precision was an effort to impress the movie executives; which was crazy because it was a dark, grungy sewer we were making, not a spaceship. We did succeed, and the set was truly impressive to see in person. However, the movie audience who saw the Vamp sewer would never realize that it was an artificial creation. Joel Fletcher and Michael Eschger using a large jig to join two sheets of metal. Michael, Hal, and Joel attaching sheet metal tubes to the wood supports. An exterior view of the set looks almost futuristic from all the sheet metal. Lisa Lyon ready for a scene in the After Dark Club set. In the movie industry set builders were considered low on the totem pole, lacking the respect they deserved considering their prominent work on the screen. In fact none of the Vamp construction crew received credit on the movie. Set construction was not exactly what I had in mind for a Hollywood job, but it helped this starving artist with much needed income until better circumstances came along. I always liked to work with my hands creating things, and had some great experiences on the show which made the whole adventure worth it.